No presorting is necessary. Simply choose your settings, place the bills in the hopper, and go. The D-551 Currency Discriminator and Counter counts the bills you want to count, and automatically diverts the others to the large 100-note-capacity pocket. Everything is performed quickly and accurately with no need to stop midway through the process. 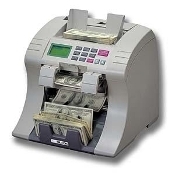 The Billcon D-551 Currency Discriminator and Counter features advanced high-speed denomination recognition technology, six modes of counting bills preset batching and a blazing 1,200-notes-per-minute speed. Billcon's unique full-line sensor accurately distinguishes between the six denominations of U.S.bills (both old and newly-issued bills). Mixed Mode(Mixed Counting): Identifies and counts mixed denomination bills, providing an error-free summary of each denomination and/or the total count. Separation Mode(Separate Denominaiton Counting): Counts a specific denomination. When a bill of a different denomination is detected, the machine temporarily stops. When bills are removed from the stacker, counting resumes. Single and Direction Mode (Different Denomination Detection : Detects the denomination and orientation of the first bill, and counts only bills of the same denomination and orientation. Other bills are fed to the pocket. Direction Mode(Specific Orientation Counting): Selects and counts bills in any of four specified orientations (face/back and left/right) without interrupting totaling. Bills of a different orientation are fed to the pocket. Convenient for organizing the orientation of bills. The Billcon D-551's Grand Total Function displays the total number of bills and their total value, as well as the total number and value of bills by each denomination. The Billcon D-551 offers five preset batches 100, 50, 25, 20, 10. Any other batches from 1 to 999 can easily be set with the control panel.